Led by healthcare giant Kaiser Permanente, a movement to ban unproven and unsafe chemical additives to hospital interiors has gained traction. 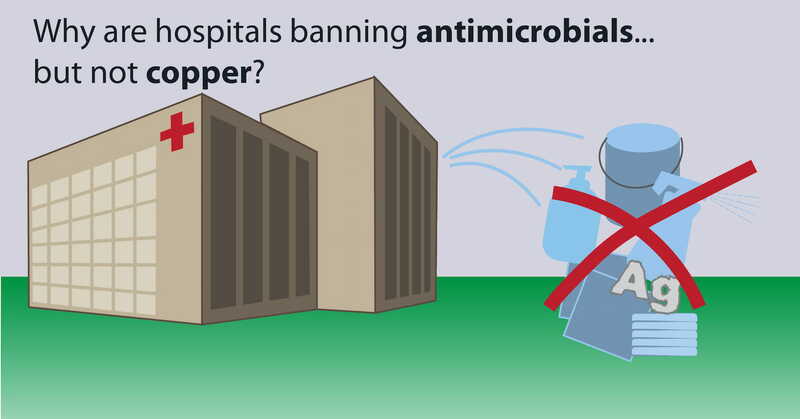 The Safer Chemical Challenge and other initiatives urge hospitals to pledge to stop purchasing unproven antimicrobials. What are these antimicrobials? Because the term itself is so broad as to include products that offer no real benefit to the user. The Safer Chemical Challenge urges hospitals to use only antimicrobials “that are registered with the U.S. EPA under the Federal Insecticide, Fungicide, and Rodenticide Act (FIFRA), and have published data that shows efficacy in a hospital/clinical setting measured by a reduction in healthcare-associated infections (HAIs) as part of comprehensive infection control measures.” What does this mean? What are some of the products that fall under the category of “antimicrobials? There are many chemical additives that are considered antibacterial, antifungal, bacteriostatic, fungistatic, and even microbiocidal that do not meet both of the above conditions, EPA registration and clinical data. These include additives to paints, adhesives, sealants, plastics, ceramics, furniture, textiles, and even flooring and ceiling tiles. Silver in its many forms (nanosilver, silver ions, silver zinc zeolites, silver sodium hydrogen zirconium phosphate) also does not meet the requirements set by the Safer Chemical Challenge, leading health systems such as Kaiser Permanente, and a growing number of hospitals. So why is copper specifically not banned? Copper is becoming a well-known biocide, with copper alloy fixtures and sheets as well as copper-infused surfaces (EOSCU being the sole copper-infused surface) demonstrating clinical and real-world efficacy against Gram-positive and Gram-negative bacteria. Copper and EOSCU are also registered with the EPA for public health claims. Therefore, copper and copper-infused EOSCU meet the two requirements under the Safer Chemical Challenge and are not banned by Kaiser Permanente or any other health system or hospital. In addition to meeting the requirements of the Safer Chemical Challenge, copper has no deleterious effects on people or the environment. As an essential metal, it is required by the human body for several key functions, and our bodies are well-equipped to process and use copper. . In a marketplace flooded by products touted as “antimicrobial,” it is difficult to trust what you hear. If even a healthcare giant like Kaiser Permanente has to stop and examine the proof behind the words, it is understandable that we all should consider doing the same. When it comes to recommending a product as something that a hospital can expect – and trust – to help them fight infections and protect their patients, the stakes could not be higher.